IREM Risk Management Print Publications will help you expand your skill set and provide resources for every step of your career development. No matter your level of experience and expertise. Watch co-author Richard F. Muhlebach, CPM, discuss the book. 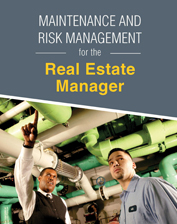 Turning around a troubled property ranks among the greatest management challenges that a real estate manager will encounter in their career. While there is no one-size-fits-all template for managing troubled properties or working as a consultant, this Key Report provides solutions and a frame of reference for some of the most common challenges. Regardless of skill level, real estate managers will find guidance in all key areas when working toward the end goal-turning around a troubled asset. 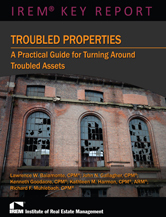 When coming face-to-face with challenges, this report will also help build a comprehensive understanding to evaluate and resolve troubled assets for both residential and commercial property types.